The renewable powerhouse will use Demand Energy’s expertise to get more out of its generation assets. The year in energy storage started off with a bang as Italian utility Enel acquired a 100 percent stake in U.S.-based Demand Energy, a developer and operator of energy storage systems and software, for an undisclosed amount. Enel's renewables division operates 36 gigawatts of clean energy around the world. The North America subsidiary, which will control Demand Energy, has more than 100 plants spanning hydropower, wind, geothermal and solar energy, with a managed capacity of more than 2.8 gigawatts. That global portfolio now has become a ready and willing customer for Demand Energy's storage and energy management software, named DEN.OS, for Distributed Energy Network Optimization System. That's not a bad outcome for the 30-person American startup with just 3 megawatts and 9 megawatt-hours of installed storage capacity under its belt. The goal now is to quickly scale Demand Energy's resources and capabilities, said President and CEO Gregg Patterson. "As we were looking at our options, Enel clearly stood out," he said. "They have a monstrous renewables portfolio worldwide and they really wanted a dependable and capable software platform. We were looking for the ideal partner to scale and grow behind the meter, in front of the meter and in microgrids." Demand Energy has taken an increasingly popular route for American storage and grid edge startups that have operational experience but need more capital to scale: find a European utility. The energy conglomerates across the pond have proven willing to invest money in emerging grid service companies, even if their American counterparts aren't ready to pull out their wallets. Demand Energy got started in the early days of advanced energy storage, back in 2008. At first the company chased the front-of-the-meter storage market, but found there wasn't yet enough interest from utilities. Instead, it pivoted to behind the meter, marketing to commercial property managers in New York City. The storage could help manage energy costs and demand charges, but there was something deeper at stake. In the wake of Superstorm Sandy, New Yorkers were reeling from the instability of the metropolitan grid in the face of extreme weather events. In the high-flying skyline of the city, loss of power can mean elevators cut out and water stops pumping to the tops of buildings. These conditions created a compelling resilience business case for storage even without policy drivers like California's statewide deployment mandate. In 2012, Demand Energy installed a demand shifting, 225-kilowatt, 2-megawatt-hour battery system in the basement of Manhattan's 58-story Barclay Tower, a luxury residential building. The success of that project generated more business with the property owner, Glenwood Management, that culminated in 1 megawatt of energy storage distributed across its property portfolio. As it deployed more systems, Demand Energy tapped into the market-based incentives available in New York, such as utility Consolidated Edison's demand management programs for the Indian Point nuclear plant and the Brooklyn and Queens substation deferral. In each of those cases, the utility opted to pay for distributed demand management as a cheaper alternative to larger capital expenditures for grid upgrades. Gov. Andrew Cuomo announced this week that Indian Point nuclear power plant will shut down by April 2021, eliminating generation capacity equal to one-quarter of the power demand in NYC and Westchester County, according to the New York Times. That news underscores the city's growing need to meet peak demand through sources other than conventional, big-ticket grid upgrades. Most recently, Demand Energy has been finishing up a microgrid at an affordable housing complex in Brooklyn, combining rooftop solar, a fuel cell and lithium-ion batteries. The system will cut electricity burden for the buildings, ensure resilience in event of a blackout and serve the broader grid through the demand response program, which also provides a source of revenue. 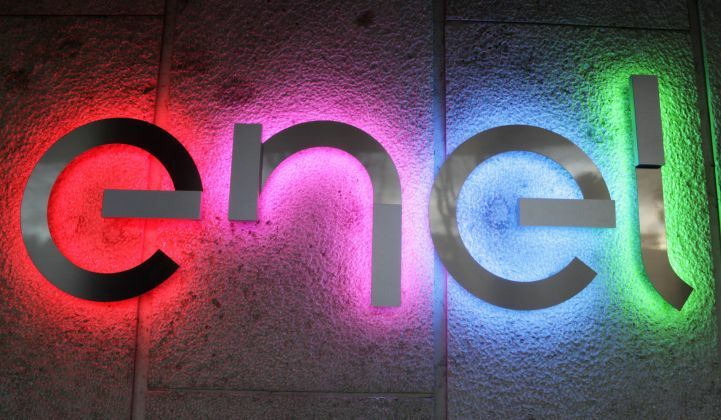 In this acquisition, Enel gets a company with years of experience deploying and operating storage in front of the meter, behind the meter and in microgrids. The utility, though, appears most excited about the company's software. The capabilities of DEN.OS developed through each phase of the startup's evolution. The early switch from utility-sited to customer-sited projects forced the company's engineers to develop a more complex control paradigm. A utility storage system typically operates in response to SCADA control signals from a central command center. "Behind the meter, you don't have anyone telling you what do you -- you just have the load," said Doug Staker, vice president for global sales at Demand Energy. "Based on cost factors, what’s the best economic operation? You have to be more situationally aware and economically driven." The IP they created looks at how much energy a building is using, how much it costs to charge and discharge the batteries, what programs are available to participate in for money, what price signals the market is sending and more, and then determines how the battery should operate to maximize economic return for the customer. Managing a network of storage systems across Glenwood's different properties offered proof of concept for the software's ability to aggregate across different sites and optimize for a broader challenge than any one site. The microgrid work shows the ability to manage different forms of generation, as well as storage. The result: a platform that the company says can optimize system-wide energy operations, not only for storage project but also generation, transmission and distribution and microgrids. "It can be deployed across pretty much any electricity system that’s out there," Patterson said. "We had the ability to prove and verify the capabilities of our software. Enel spent lot of time really making sure the technology delivered." The pairing with Enel now opens the door to more storage project development around the world, but the software has the potential to scale much faster. "This is all about the software," Patterson said. "Software is really portable and fungible. We can quickly move and deploy it." Now the team will be able to do so around the world with the backing of Enel's worldwide business development resources, as well as its engineering, construction, operation and maintenance expertise. Demand Energy had multiple interested parties, both domestic and international, Patterson said. Still, it's notable that a European utility won out. Multinational energy companies based in Europe have shown strong initiative in racking up large renewable energy portfolios and moving swiftly to acquire startups that will help them manage the decentralization and decarbonization of the grid. In September, a subsidiary of French mega-utility EDF acquired Groom Energy Solutions, a Massachusetts-based, full-service energy services company serving customers with big portfolios of buildings in the commercial and industrial space. That gave the French company 67 pairs of boots on the ground to grow its business in the U.S.
French utility Engie bought an 80 percent stake in California-based C&I storage specialist Green Charge Networks in May. The buyer said it would use the acquisition to deploy standalone storage and storage-plus-solar configurations for clients in the United States. Engie also bought energy services company OpTerra in February. A subsidiary of U.K.-based Centrica bought circuit-level energy sensor company Panoramic Power in November 2015. That's just to name a few, and not including strategic investments. Several U.S. utilities have invested in solar installers in recent years, but haven't shown as much interest in storage or grid services acquisitions, with a few exceptions like Southern Company's large purchase of microgrid leader PowerSecure. If U.S. power providers want to get in on the distributed grid action eventually, there may be a danger to waiting -- the most promising startups might already be taken.